Reducing traffic lanes along Grand Street in Jersey City to provide dedicated bicycle paths may be a mistake, says Rev. Alexander Santora, a long time critic of similar changes recently enacted along Observer Highway in Hoboken. Earlier this month, Bike JC – a group dedicated to promoting safe bicycle-riding in Jersey City – lobbied the City Council to make changes to Grand Street similar to those made along Observer Highway, a major gateway thoroughfare into Hoboken’s downtown area. The plan would have the city reduce the existing four lanes to three, with one lane going each way and a center lane for making left hand turns. This would provide room for a dedicated bicycle path. Bike JC said they used Observer Highway as a model because it had successfully created a safe lane for bicycle riding and reduced dangerous car traffic. Santora, however, said those changes created more problems than they solved, and suggested the changes were designed instead to discourage car traffic from entering Hoboken from Jersey City. Santora lived on Sussex Street until about 12 years ago, but said conditions have become more congested in the area. What will frustrated drivers do? Observer Highway, he said, is always backed up with traffic, and the changes to promote bicycle safety may have made it worse. The changes add to the frustration of drivers, he said, who often create lanes of their own to get around parking cars, using the turning lane to also make illegal U-turns. 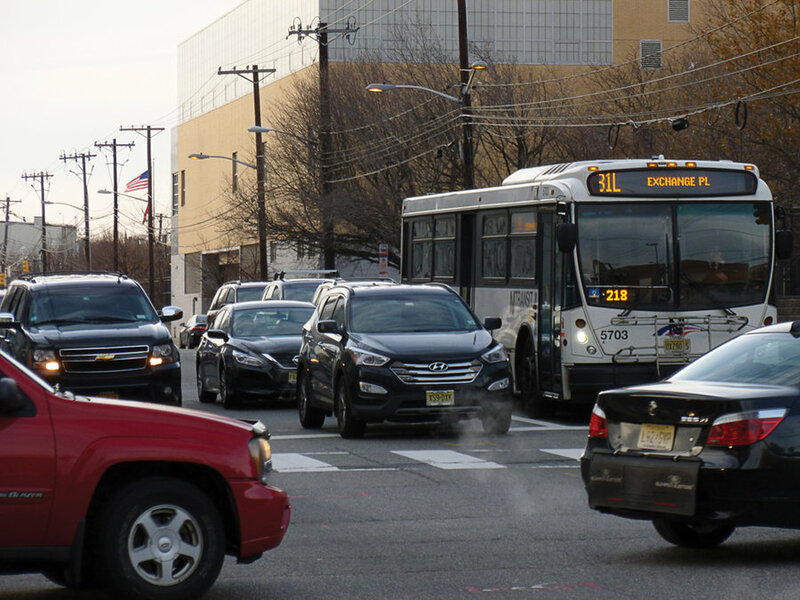 Grand Street with its high volume of traffic coming off the New Jersey Turnpike is already backed up, especially near Jersey City Medical Center and the supermarket. This is not an issue on Observer Highway, he said, where there are few businesses. In many cases, bicyclists in the area avoid Grand Street entirely or ride on the sidewalks. Bike JC said bicycle lanes would get people off the sidewalks. Councilman Boggiano said bicyclists post a number of traffic issues themselves, from riding on sidewalks to running red lights or driving down the middle of the street. Many, he said, are not using the bicycle lanes already established in the city. For the most part the council members appeared to support the redesign idea, in particular, Ward E Council Member Candice Osborne. She was instrumental in helping to develop the CitiBike Jersey City program. She has asked the city’s engineering department to look into the idea. But some other council members have raised concerns. Councilman Daniel Rivera said he was concerned about public safety for the area since it is already difficult for ambulances to get in and out from one of the hospital driveways. “That road is already congested,” he said when first hearing the proposal. Later, he added to his. “One of my concerns is that they are asking for an entire side to be eliminated, which will definitely congest the city and even downtown more,” he said. “Although I like the project or the talk about a pedestrian/bike lane I’m a little more concerned about public safety vehicles getting to their destination in what could be even more congested situation. I’m sure the Department of Traffic and Engineering maybe design this so that it could work but I have my reservations.” He said he liked the idea of the street bike lane, and thought maybe other parts of the city could benefit from such a redesign. Another proposal Bike JC suggested was to build out corners to aid pedestrian crossings, something that Santora said has had a negative impact in Hoboken where cars cannot pull over to a corners to let passengers exit. He said such changes to street corners make sense in some places like the corner of Communipaw Avenue and JFK Boulevard in Jersey City, but not in other places. While Jersey City has yet to determine funding for the change if it agrees to make it at all, Hoboken used federal money and cannot change it back for five years.